Thomas Glover was the last member of the Beeston Old Boys Association to make the Supreme Sacrifice during the Great War. He was in the original party of ex Beeston Boys Brigade young men who marched with their founder to join the forces at a Recruiting Office in Nottingham. Both Thomas No 14069 and Hubert Harper No 14068 who survived the war must for some reason have registered after the others because of the gap between their service numbers. Thomas Glover was born in Beeston on 15th June 1893. At the time of the 1901 Census2, he was aged 7 and living at 62 Windsor Street, Beeston with his parents, Edwin and Clara (née Barker), and there was two younger sisters, Clara (then aged 4 and Ethel (2) and a baby brother, Frank (then 5 months). His father worked as an iron turner. During the next ten years, another brother (Ernest, 1903) and three sisters (Elizabeth, 1905, Lavinia, 1907 and another in March 1911) Thomas attended the Nether Street School, leaving there to find work in 1906. He joined the Boys Brigade on 2nd July 1909 when he was employed at the Beeston Foundry and still living at 62 Windsor Street. 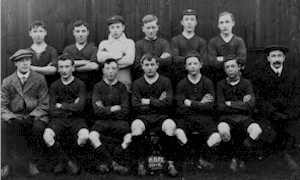 In the Brigade he was a member of the first team football squad of 1910-11 (he is standing, second from the left in the photograph - click to enlarge for more details), and was also an active member of the Mens Sunday Guild. This is how the Boys Brigade Magazine "Anglo" described Thomas Glover in "Football Notes". Height 5ft; Weight 8st 2lbs; "ready when wanted." Owing to the brilliance of the players in the first XI, his chance of showing his worth with that body have been very limited. Has now settled down in his proper position as "mascot" to the team. The Sherwood Foresters Roll describes Private Thomas Glover's, service record as being with the 9th Battalion when they landed in the Balklands in August 1915, it appears, by these records, that he survived the battles of August and is shown in the "Digest of Service" in Regimental Archives as being with the 3rd Battalion in England on 16th November 1915, then posted to the 1st Battalion on the 21st December 1915. 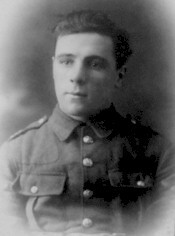 The 1st Battalion records him joining on the 30th January 1916 where he served with "A" Company. He was transferred to the Machine Gun Corps on the 18th February 1917 and later to the 3rd Battalion Royal Tank Corps as No 77416. 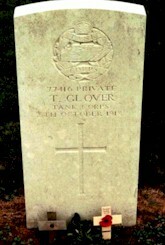 Private Glover was killed in action on 8th October 1918 while serving with the 3rd Tank Regiment and is buried in Busigny Communal Cemetery Extension. His memorial is shown left. Busigny was captured by the 30th American Division and British Cavalry on 9 October 1918, in the Battle of Cambrai, and in the course of the next two months the 48th, 37th and 12th Casualty Clearing Stations came successively to the village. The majority of the burials were made from these three hospitals. The cemetery extension was begun in October 1918, and used until February 1919. After the Armistice it was enlarged when graves were brought into Plots II-VII from a wide area between Cambrai and Guise. Towards the end of 1915, Thomas Glover had married Dorothy Smith, the daughter of Edwin Smith, a railway train examiner, and his wife Lydia4. In the Absent Voters List of 1918, Thomas is registered at 101, Queens Road, Beeston. 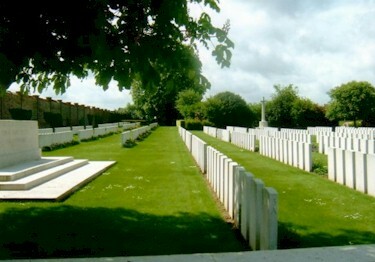 1The photograph of Busigny Communal Cemetery Extension is from The Lost Generation website (http://www.ww1cemeteries.com) with their kind permission. 3Description of the Royal Tank Regiment based on Wikipedia : Royal Tank Regiment, http://en.wikipedia.org/w/index.php?title=Royal_Tank_Regiment&oldid=318528293 (last visited Oct. 8, 2009).